Imagination can run wild when thinking about the workplace of the future and what it may look like, but for many of us, the future of work is already here. Particularly when technologies like cloud, social, mobility and video collaboration are enabling so many organisations to work in ways never seen before. Across the region, Asia Pacific businesses and Governments continue to invest in transforming their workplaces to remain competitive in the digital era. Recently, the Australian Federal Government announced it will invest $350 million over three years from 2017-18 on a range of digital transformation initiatives. It intends to modernise, transform and enhance the productivity of agency ICT systems, as well as training staff members in digital skills. Let’s face it, resistance to change and being drawn to what’s familiar is human nature. The same can often apply to our technology preferences; a recent Gartner 2017 CEO Survey highlighted an expectation gap among CEOs regarding which type of technologies will best achieve their desired productivity gains. The survey shows that Asia Pacific chief executives expect productivity in their organisations to increase by 24% by the end of 2018, with revenue – cited by 26% of respondents – and profitability (15%) named as the top two metrics of success. However, when it comes to achieving those productivity gains, CEOs believe conventional technologies like cloud will help them, rather than newer technologies that support digital transformation. While cloud may be considered conventional by early adopters, it still has a significant role to play in helping businesses take that first all-important step when considering newer technologies and environments. It may also be a lower risk way to introduce the CEO to what’s possible in the workplace of the future. Either way, successful CIOs will be those who can also take on the role of technology evangelist within the C-Suite: becoming effective storytellers, educating their CEO about the potential of newer transformational technologies, and how they will connect the dots to achieve business goals. This will also mean finding innovative ways to show the CEO what’s possible beyond using comfort zone tools like email. For example, demonstrating how intelligent collaboration solutions can work together to create more agile, activity based working environments. Or explaining how 21st century technologies such as collaboration, robotics and artificial intelligence can play a significant role in the company’s digital transformation journey. Keeping Up with the Demands of a Flexible Workforce The other issue facing many CIOs today is how to best satisfy the demands of an increasingly mobile workforce who want the flexibility to collaborate and remain productive from just about anywhere. We recently undertook a global study that explored the future of anywhere, anytime working and the impact technology is having on both employee behaviour and workplace culture. An overwhelming 98 percent of all respondents, believed that anywhere working has a positive impact on productivity and what’s more, almost two thirds of the global working population are currently taking advantage of flexible working practices. Measuring the uptake and utilisation of existing collaboration tools can help you discover quick win opportunities for improved productivity gains, e.g. number of team video conferencing meetings held in a week. Establish current collaboration usage and combine this with a strategy to address issues (such as the availability and type of tools, adoption programmes or workflows), your teams can improve their collaboration significantly if you equip them whether at home, on the go, in a small huddle space or larger meeting room. Choose a solution that is easy to use. 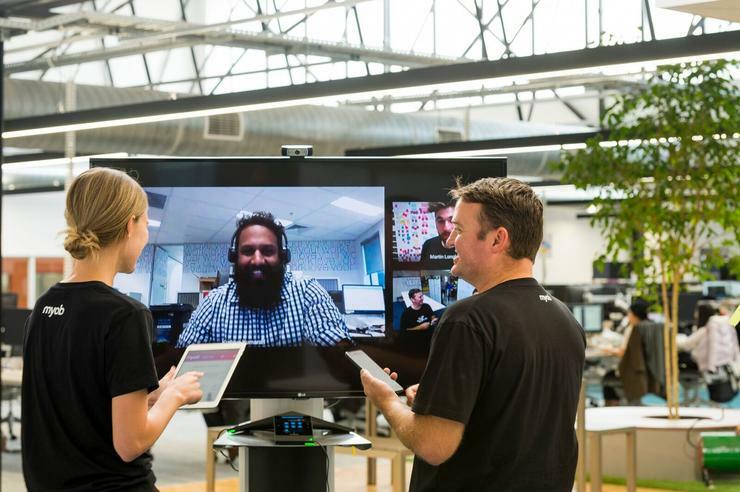 Video collaboration adoption requires systems to be easy to use and manage, while delivering a consistent, great experience anywhere and on any platform. Integrate and streamline, again for ease of use and quick adoption. Users need new collaboration technologies to be integrated with popular communication platforms like Microsoft Office 365 and normal day to day workflows. Choose solutions that are interoperable and provide secure access regardless of location, network or device. Work with your IT Team to update Bring Your Own Device (BYOD) policies to accommodate the needs of flexible workers and contract staff to ensure they remain productive and connected regardless of location. Involve HR where needed to ensure flexible working is inclusive to all. Perhaps ironically, the more advanced technology becomes, the more we become immersed in it – while at the same time, the more we crave human interaction. You can’t automate real-life face to face contact nor would you want to, but we can make technology more intuitive, natural, and personal - so using it is as easy as breathing! For me, solutions that make technology more human and are easy to use, deploy and operate will ultimately win when it comes to digital transformation and the workplace of the future.